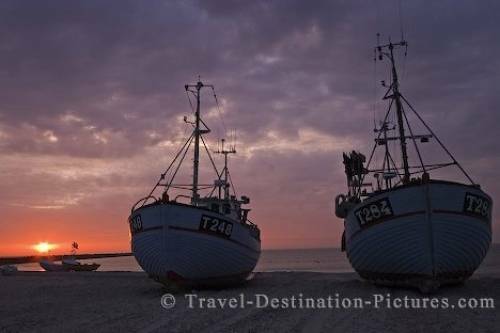 Fishing Boats on the shore of the North Sea in Denmark, Europe. Even on Denmark's rural west coast, scenes like these are hard to find anymore. There are only a few "harbours" left which operate like this one, pulling the boats and ships right up on the beach. The stranded vessels nonetheless are giving a very special setting to watch and photograph the sunset. Picture of fishing boats pulled up on the shore of the North Sea in Denmark, Europe.